IRS Form W-4s or the "Request For Federal Income Tax Withholding From Sick Pay" is tax form released and collected by the United States Internal Revenue Service. The January 1, 2018 fillable version of the W-4s Form can be downloaded below in PDF-format. The IRS-issued "Request For Federal Income Tax Withholding From Sick Pay" is available for digital filing or can be filled out through the Adobe Reader application on your desktop or mobile device. Give this form to the third-party payer of your sick pay. Go to www.irs.gov/FormW4S for the latest information. Claim or identification number (if any) . Separate here and give the top part of this form to the payer. Keep the lower part for your records. 3 Subtract line 2 from line 1 . 5 Credits (child tax and higher education credits, credit for child and dependent care expenses, etc.) . 8 Subtract line 7 from line 6 .
you receive to less than $10. (25%) will be withheld from a partial payment of $80. are already required to withhold federal income tax from sick pay. agreement, see your union representative or employer. 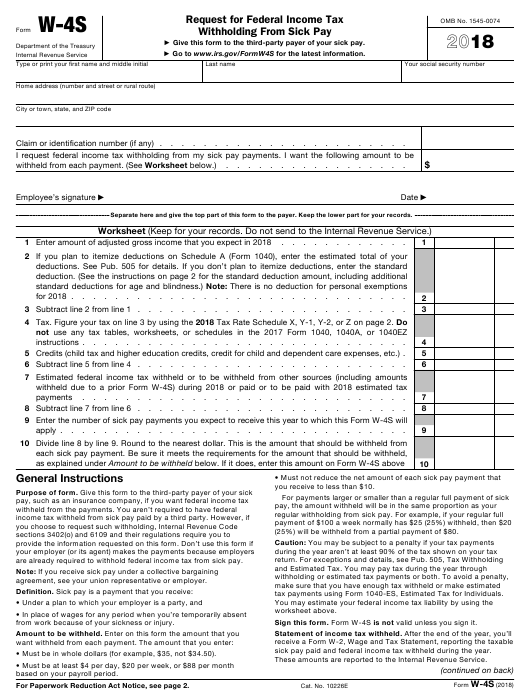 tax payments using Form 1040-ES, Estimated Tax for Individuals. Sign this form. Form W-4S is not valid unless you sign it. from work because of your sickness or injury. sick pay paid and federal income tax withheld during the year. • Must be in whole dollars (for example, $35, not $34.50). These amounts are reported to the Internal Revenue Service. based on your payroll period. “Revoked” in the money amount box, sign it, and give it to the payer. basis for estimating your tax, tax credits, and withholding for this year. total tax covered by estimated tax payments or other withholding. in figuring the amount you want withheld. blind, see Pub. 505 for additional amounts that you may claim. following individuals, the standard deduction is zero. request a change in the amount withheld. • A nonresident alien individual. because of a change in his or her annual accounting period. adjusted gross income. See Pub. 505 for details. Married filing jointly or qualifying widow(er) . elderly or the disabled. See Pub. 505, Table 1-2, for credits. Single or Married filing separately . return, see Limited standard deduction for dependents, later. as required by Code section 6103.